The Lester Family Syrah is one of the more interesting cool-climate Syrahs I’ve encountered for this blog. I know it well, I’ve been helping out at Scott Sisemore’s little winery in San Carlos, CA for a couple of years now. 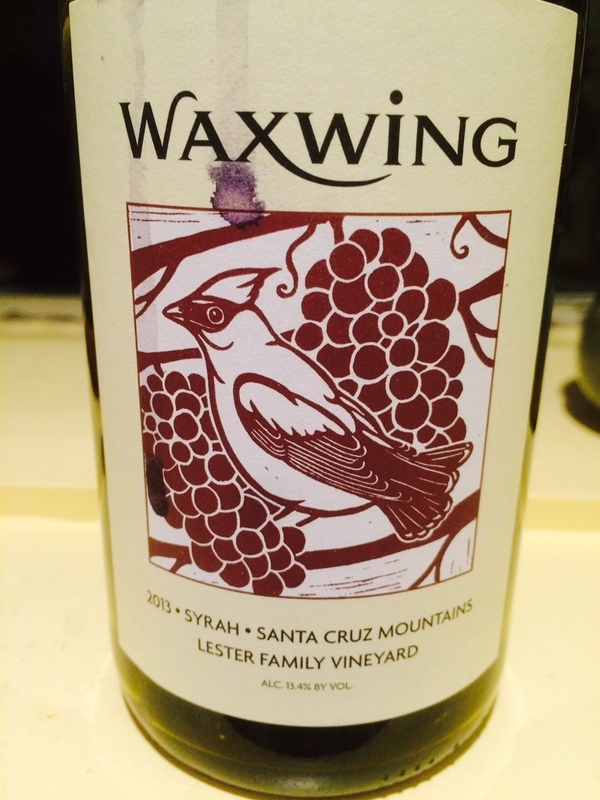 The 2012 Waxwing has an unmistakable aroma of green peppercorn on the nose which has made it something of a niche wine. I have the sense that it’s a wine that will integrate more over time so I’ve got a few bottles put away for safe-keeping. For the moment though, if you’re not a fan of green peppercorn, the Syrah can be seen as a tad too exotic. With the 2013 vintage, for whatever reason, there’s less of that green peppercorn. It’s there but it’s couched in bitter chocolate and brambly black berry aromas. There are aromas of meat, too, and an intriguing bit of iodine in the background. The palate is full but light with a bit of a dusty, tobacco-y finish and the tannins are, right now, surprisingly approachable for a 2013 Syrah. This is good stuff and speaks to the potential of the Lester Family Vineyard to produce Syrah not just for wine geeks who like to #keepsyrahweird, but also for those just looking for a balanced and intriguing wine. Scott has recently moved out of a shared winery space into a smaller dedicated warehouse for his winery and has by necessity adopted more of an old world method for making his wine. There simply isn’t room for the larger equipment he used when he shared space and costs with other winemakers. All the wines are now crushed by foot and they’re all 100% whole cluster. To me, all this makes for compelling wines. The Lester Family Vineyard is located just behind the town of Corralitos south of Santa Cruz. The area has become known for Pinot but, as is the case with many of the cooler-climate growing areas in California, there’s great Syrah to be had there too. The vineyard is influenced by fog due to its proximity to the coast. It’s managed by the ubiquitous Prudy Foxx who looks after many vineyards in that area with meticulous care. When Scott first relocated to the peninsula from Sonoma County, he kept many vineyard connections with that area but he’s gone through a bit of a shift living down here and has moved towards more vineyards in the Santa Cruz and farther south in Arroyo Seco and the Santa Lucia Highlands. I’m excited about this southward progression because I think there’s great potential for wine with a cool-climate bent along the coastal hills south of the Bay Area. Lester Family Syrah bears this out. It has a distinct aroma profile, vintage after vintage, that makes it one of the more fascinating New World Syrahs I’ve ever tried. You know I’m always game.! 2014 Donelan Kobler Family Vineyard Syrah Green Valley, 96 pts. Workman Ayer 2014 Defacto Syrah Blend Santa Barbara County $38 92 pts.